The men’s showdown was once again an ocean battle between Paddle League ratings leader Michael Booth and number two seed Titouan Puyo, while the women’s event saw something of an upset as Sonni Honscheid accepted her first defeat of the season at the hands of Olivia Piana. Despite a day of glorious sunshine on race-eve, competitors were met with grey clouds on race day that turned from a gloomy morning into pouring rain at the finish. 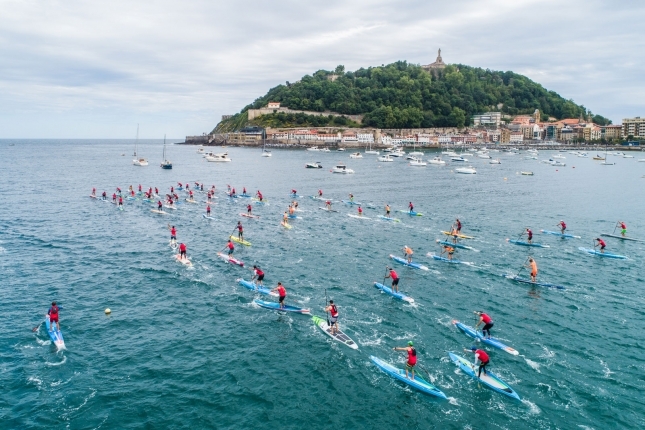 The cooler conditions were a welcome relief to most paddlers though, with the draining European summer sun often as much a factor in these races as the wind and waves. After a shocking start that saw him lose his cap and get stuck in the middle of the field, Boothy began motoring through the pack and was soon out front as the race exited the ocean and headed to the relative calm of the inner-city river for a 1km respite. As we’ve seen time and time again, the only one that could go with Boothy was Titou, but unlike previous weeks the Frenchman was determined to keep the Aussie on a leash. 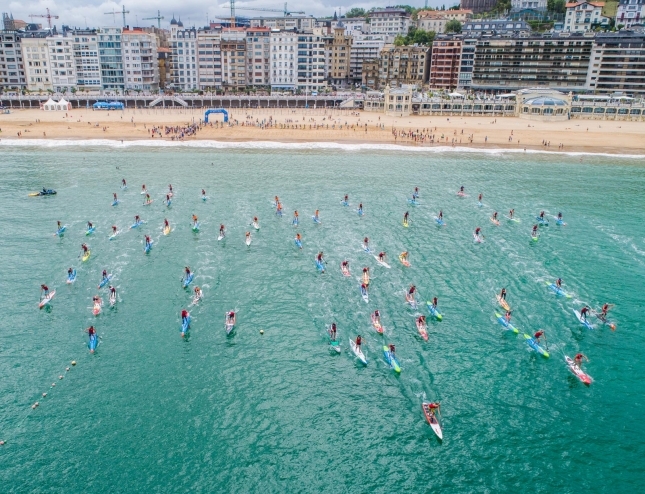 Thanks to a fall from the race leader and a surge from his Quickblade paddle, Titou caught Boothy at the first bridge and would stay side-by-side until the race hit the W-shaped in-and-out surf section on San Sebastian’s northern beachbreak. A quick pitstop to correct a leash wrapped around his fin cost Titou valuable time as the leaders headed back out into the ocean, and the gap was slowly but surely extended as the Starboard powerhouse put the hammer down in the bumpy conditions. Titou dug deep as the bumps rolled in from seemingly ever angle, narrowly closing the gap and setting up a thrilling finish in the final kilometre; an arm-wrestle between two of the modern greats. But with Titou unable to fully close the gap in the ocean, and with the water going calm inside the semi-protected bay of San Sebastian, Boothy began to extend his lead once more and snuffed any hopes of a change on the EuroTour podium. 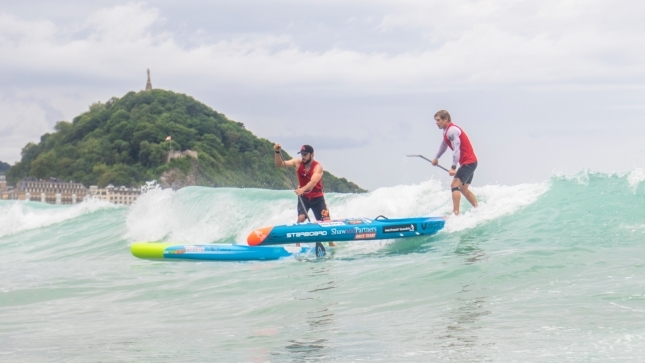 The Aussie world-beater eventually crossed the line in 1 hour 12 minutes to record his third straight European win and extend his lead on both the EuroTour and Paddle League World Rankings (San Sebastian was a 4-star race for both series). Titou was excellent today, but Boothy is in formidable form. Sitting third virtually all day was Arthur Arutkin, who’s had a busier race schedule than he was expecting this year but who is clearly still in great form. The peleton threatened to close the gap on Arthur in the final kilometre, but the Red Bull rider hung on for the points that will cement his position near the top of the EuroTour leaderboard as we head towards the “Big Three” of Bilbao, Hossegor and Germany. Italy’s tireless workhorse Leo Nika dragged the peleton for much of the day and was rewarded with a fourth place finish in front of team mate Bruno Hasulyo, with an interesting mix of Sprints and Aces among the Starboard crew (most opted for the Sprint despite the bumpy ocean conditions, something that’s become a theme the past season or two — only Leo stuck with the Ace). There was a great battle between Kiwi Marcus Hansen and dark horse Brazilian Guillherme dos Reis, with the South American stealing sixth place after a “wave from God” rolled through the otherwise-calm bay just at the right time to see Gui surge up to Marcus in the final metres and hang on for the 30 metre dash up the sand to the finish line. The highly under-rated Italian Paolo Marconi had another solid result to continue his fine EuroTour form this summer, finishing 8th and a few seconds ahead of Daniel Hasulyo and Paul-Conrad Deleare, who themselves enjoyed a sprint to the line that the elder Hasulyo brother narrowly won. In a sign of just how tough the competition is in Europe these days, Carolina hero Mo Freitas was 11th on the timesheet and 12th overall; Aussie Ty Judson DQ’d himself after he switching boards with one of the spectators mid-race. Ty knocked his fin out in the shallow river stretch and simply wanted to finish the race, finding NSP-designer Alain Teurquetil – who’d perched himself front and center to enjoy the ocean leg – as a willing trader. Itzel Delgado (Peru; 12th), Ludovic Teulade (France; 13th), David Leao (Brazil; 14th) and Denmark’s young Christian “Polar Bear” Anderson (who caught one of the waves-of-the-day) rounded out the top 15. 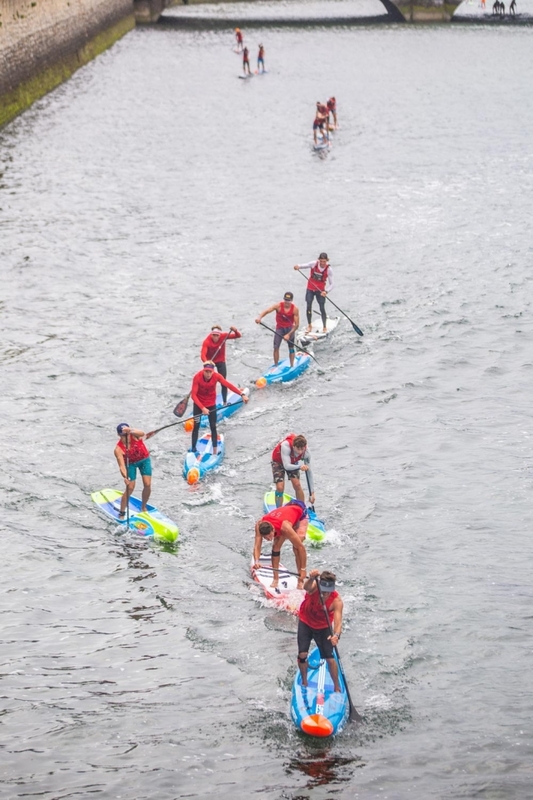 But no matter where they finished, most of the paddlers agreed: this was a classic, “all-in-one” style race that proved both fun and challenging. On the women’s side it was a script-tearing performance from Olivia Piana, with the strong Frenchwoman handing Queen Sonni her first defeat of the season. The German powerhouse had won five-straight Paddle League events stretching back to the first World Tour stop in Tahiti, and her form in the first half of the race – where she led by 30 seconds – suggested win number six was on the cards. Olivia had other ideas though, first reeling in and then breaking away from Sonni in the rough and tumble of the long open ocean leg. 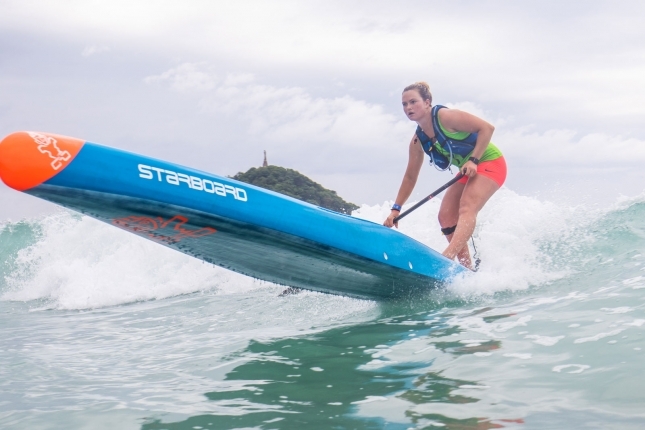 By the time the leading ladies hit the unique, Z-shaped “chicane” for the final, technical 500 metre paddle to the beach, Olivia was up by 10 seconds and made it a certainty after Sonni fell at the third last buoy. The fact Olivia’s win could be considered any sort of upset at all (she’s the number three seed and was/still is considered one of the favourites for this year’s Paddle League World Title) shows just how dominant Sonni has been so far this season; the Frenchwoman’s victory will inject new life into The Paddle League World Title quest that had looked to be nearly over after Sonni amassed a small fortune of points in the early part of the season. 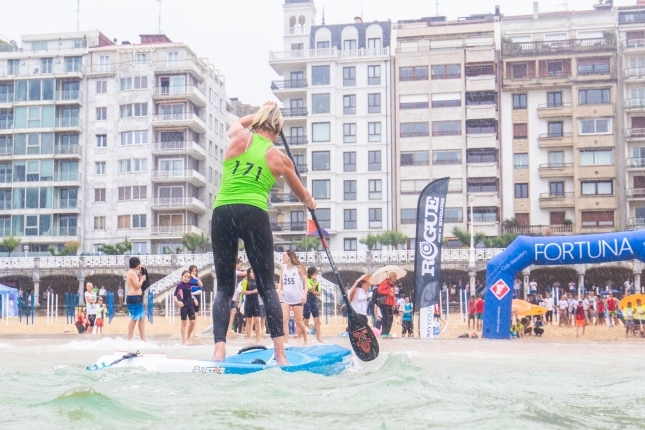 Coming home third was Oregon’s Fiona Wylde who arrives in Europe ahead of the “Triple Crown of Majors” in Bilbao/Hossegor/Germany starting next week. Fiona, just like most paddlers today, was happy with to race on a course that served up a bit of everything. San Sebastian has certainly become one of, if not the most interesting course in the world. With a unique mix of open ocean, flat water and waves, combined with one of the coolest cities in Europe, San Seb is quickly becoming one of the must-do stops of the EuroTour. The race is also just 12km, which keeps the contest under 90 minutes and offers contrasting relief to the seemingly-endless stretch of long-distance races we’ve become too accustomed to. Outside the women’s podium, it was another solid result for France’s Amandine Chazot (4th), before an all-the-way-to-the-line battle between the two top Spaniards in Laura Quetglas (5th) and Susak Molinero (6th). The unheralded windsurfing pro Caterina Stenta (Italy), ratings leader Noelani Sach (Germany), Susanne Lier (Germany) and Peru’s Giannisa Vecco rounded out the top 10. Well done to everyone that finished today’s challenge, and a big thanks to the EuroTour crew and local organisers for giving us one of the most interesting courses of the year. Keep an eye out on Facebook and Insta for more photos and video highlights in the next 24-48 hours, but for now here a few quick shots from San Sebastian (or “Donostia” as it’s known in the local Basque language). Well done to these juniors that completed the main event alongside the world’s best. The future!